Wink Bingo is a well established online bingo website and has a modern colourful fresh feel to it. With plenty of choice in online bingo games, it is a great place to choose for all your bingo fun. Joining as a new player today means you can claim their current welcome bonus offer. This will see you get a 300% cash match in free bingo bonus. Not only that but at the time of this article, you will also receive a £10 shopping voucher to spend in the Wink Shop. First, you will need to select one of the links or buttons on this page that will take you through to the Wink Bingo website. Then click on the big ‘JOIN NOW’ button on the Wink Bingo Login / Homepage which will take you to their registration form. Make sure you complete all of the sections in full to open your account. Then you will be able to place funds in your account and claim your welcome bonus. On your first deposit, you can fund your account with as little as £10 to get you going to receive the 300% bonus worth £30. However, you can deposit more if you wish as you are eligible for your first deposit to claim up to £200 in bonus funds. Your bonus is rewarded once you have spent your initial deposit funds within 7 days. You can then also visit the Wink Shop to spend your included £10 voucher. 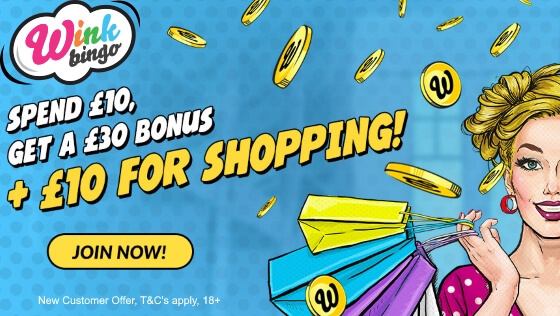 You can buy bonuses, free spins, bingo tickets and even shopping vouchers to your favourite high street shops. After making your deposit and receiving your bingo welcome bonus you can get stuck in with enjoying all the fun and games that Wink Bingo has to offer. However, before you can cash out any winnings you may earn from the free bonus cash, you must meet the wagering requirements. You must wager 2 x the deposit and bonus award added together on bingo games only to be able to withdraw. Wink Bingo offers a good selection of both 90 ball and 75 ball bingo rooms with tickets starting that can start from just 1p. However, there is plenty of free bingo games on offer that you can play to get yourself familiar with the site first. This is especially true for a newbie. You can play in their special new player room for your first 3 days where there will be £300 of guaranteed free bingo given away on each of the days. Wink Bingo always has plenty going on so make sure you check their promotions page on a regular basis so you don’t miss out on special events. So why not join the Wink Bingo party today by clicking the button below and claim a Wink Bingo Welcome Bonus. Full terms, conditions and wagering requirements are available on the Wink Bingo website.